Pokemon GO: More Steps for Participants or More Headaches for Wellness Programs? In just a few months, the Pokémon GO1 app hit nearly 50 million downloads. And it’s motivated millions of people to grab their smartphones and tap, swipe, walk, and hunt down digital creatures. Sounds pretty good if you’re running a wellness program and want to encourage people to get more exercise. Right? Take a closer look at people in the park, on the street, or even at work and see what they’re doing on their smartphones. After checking email, sending text messages, and watching funny cat videos, there’s a good chance those people are playing Pokémon GO. For example, just after the app was released SAIF Corporation Benefits & Wellness Manager Renae Coombs3 noticed an uptick in teenager foot traffic in her neighborhood. And they were all playing Pokémon GO. Then her teenage nephew came for a visit. Not long after that, Coombs’ cousin and her teenage son came to visit. And he said he wanted to scout out the neighborhood on foot in search of Pokémon, so she jumped at the chance to learn more about it. Since then, SAIF employees have been playing Pokémon GO on the company’s tree-lined campus in Salem, Ore. And it’s gaining traction as a way to encourage people to be more active. But before you send out a company-wide email promoting the health benefits of Pokémon GO, or encouraging participants to download the app, there is a potential for some unexpected headaches. That’s what Rhoda Mason4 discovered shortly after the app was released. She’s the employee health and safety manager at Sutter Physician Services in California. Sutter Health operates 24 hospitals in California, a network of medical and administrative offices, and employs more than 50,000 people. In an average year, Sutter Health handles close to 1 million ER visits, and more than 11 million outpatient visits. With two Pokémon GO incidents that had the potential to pose a security risk, Sutter Health had to take action to keep employees and patients safe. Mason recognizes that Pokémon GO does have the potential to encourage people to be more active, and could be used in wellness programs. 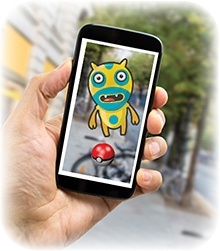 But the dogged pursuit of digital Pokémon by some people during the first few weeks after the app was released was just a little too crazy for Sutter Health to support. So what is Sutter Health doing to encourage people to be more active if Pokémon GO isn’t part of employee culture like it is at SAIF and many other organizations? Is Pokémon GO part of your wellness program? Why or why not? Coombs, R. (Presenter). (2016, Aug. 19). Maximizing your Total Rewards package to help attract and retain great talent. HR Summit 2016 & Healthiest Employers of Oregon and HR Leadership Awards. Mason, R. (2016, Sept. 1). Personal interview with Evan Jensen at Wellsource Inc.